The price was right for the quality of work. Every detail of the project was discussed and informational sheets given to us. So no surprise. Very pleased with the new counter tops. They look great and fit perfect. My husband and I are extremely pleased and highly recommend K&D Countertops. From the staff in the showroom to the installation of our new countertop, we have nothing but high praise for this company. Their measurements were spot on and the countertop was installed within 2 weeks. The installers were excellent and cleaned up after the job was complete. We love, love, love our new countertop. K&D did a very good job with our countertop. Kelly was very good to work with and also very helpful. The installation of our countertop was great and out new quartz countertops look great in our kitchen. We both love it very much. K&D is the company to go with for new countertops by far. What an awesome experience start to finish. From meeting with Anna and picking out the actual countertops, to having Brian come out and measure, to the install. Everyone is super friendly and eager to answer questions. Was also blown away by how quickly everything moved along. From paying my deposit to install was just over 2 weeks! My countertops are absolutely beautiful too! I’ll never go anywhere else. Thank you K&D. Chris, Tyler and Jarrod from K&D in Trenton, IL did a fantastic job of measuring, delivering and installing our Cambria countertops when they said they would. The finished product is beautiful and installation was perfect. They took the time to make sure everything was level and looked right. Tyler also explained the care and dos and don’ts of maintaining the look of the countertop. I am very pleased with K&D’s service and professionalism. Thank you for a good experience in giving us just what we wanted. Kelly from K&D in O’Fallon was amazing! She was so helpful through the whole process! My countertops look amazing, I can’t stops staring at them! Highly recommend!!! K&D Countertops were great to work with. From the start working with Kelly to get everything started through the final installation, Kelly was there insuring everything went according to plan. The whole experience was great from beginning to end. The process was easy and straight forward. Seeing the actual quart pattern as it was laid out prior to being cut insured you would be happy with the end results. The installation team was very courteous and professional. They removed and disposed of the old counter tops at a very low cost. Overall we were very happy with the experience. We are extremely happy with our countertops and the entire purchasing experience with K&D. Dan, our salesperson, was very knowledgeable and led us down the right path with the products we purchased. We bought the countertops, sink and faucet all from K&D. All of them are high quality and first class. The installation crew was amazing. They were on time, took great care to install the countertops and to protect our cabinets and flooring. They were very professional, courteous, and considerate of our time and property. I could not have picked a better more professional crew. After the installation was completed they left our house cleaner than when they arrived. They even fixed a couple of scrapes on the cabinet I made during the removal of the old countertops. That is customer service. Additionally, the soap dispenser was bad and one call to their customer service had us a new one delivered to our house the very next day. This was a total customer experience that was top notch. I give them five full stars only because I was not allowed to give them ten full stars. I would recommend them, and I do, to everyone. Great job to all of you. Thank you very much. We had a great experience working with K&D. Jeremy was so helpful and we couldn’t be happier with our new countertops! My experience was simply outstanding! From my initial email asking questions and the quick responses to making my selection and the install-this company is top notch. I worked with Wes who was amazing. He communicated extremely timely and went above any customer service interaction I have had in a very long time. (Yes-I even wrote a letter to the headquarters.) Wes, if you are reading this-thank you! We really had a wonderful experience using K&D Countertops! Every person form Dan in the showroom to final installation were so professional and my countertops are fabulous! Our kitchen isn’t complete yet but the countertops are the crowning jewel! K&D is faithful to their motto of having totally satisfied customers. In our case, there was a serious problem with the external sink supplier (wrong sink). K&D made adjustments to their schedule and installation to come back and install a new sink within the very short time constraint before Christmas. They went the extra mile. We highly recommend K&D for their dedication, professionalism and service. We love our new kitchen countertops. Thank you K&D. 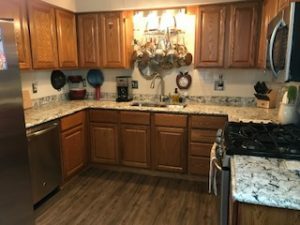 Just completed my kitchen remodel and used K&D Countertops for the second time. They did a great job and I love my new countertop! Dan was very patient and helpful as I made my selection from the wide variety displayed in the store. The installers were polite and professional and everything was completed in a timely manner. I would definitely choose K&D Countertops again! The whole experience with the measuring, construction and installation of our new quartz countertop was stellar. Chris and Tyler have our highest recommendation. They were prompt, courteous and respectful to us and our property. We love our new countertop and will recommend your company to others. Thank you for a great experience! Great company to work with! Kelly answered all questions promptly and thoroughly. Countertops came in quickly, installed quickly and look great. Very painless process. The hardest part was deciding which countertop to choose! Love the sink and faucet as well. Very satisfied. Highly recommend. Yesterday the K&D Countertop installation team was at our house installing our new Armitage countertop in the house. Thomas, Cameron and Jordan did an incredible & outstanding job with the install. They go about their job as if they are doing it in their own house with both pride and workmanship. This is not the first job that K&D has done at our house, as we had a new customer master bathroom vanity installed last year as well. I have purchased several remnants for our fireplace hearth, a bakers rack and a porch project. Great company that cares about customer satisfaction and doing things professionally. We thank you for a job well done and all the best! The designer, Jeremy was great. 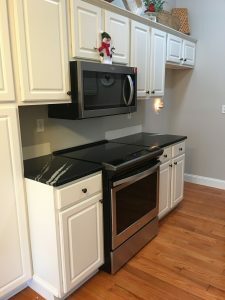 The counter top is beautiful and the guys who came out to take measurements and do the installation were real good, courteous and professional. A great buying experience. I was needing a bathroom Vanity top that was custom made and needed to be very large. I also needed a shower surround. When I first visited K&D ‘s show room I was pleasantly surprised by their displays! They were not some little 3×3 squares to look at they were giant slabs of quartz so you could see all the patterns and get a better idea of how your project will look. I met Kelly at the O’fallon location and she helped me make my decision and showed me the endless choices. Everyone I met the measuring crew, installation, and scheduling crew they all couldn’t have been nicer or more helpful & above all professional. My vanity & shower look amazing! I will definitely use K&D again. I stopped at Hwy K / O’Fallon location and Kelly was very helpful. I checked out 2 other local countertops companies and K&D had a better price. Kelly was more organized with the details and next steps. The guy who did template was very detailed and the installers were far better than I had experienced previously. I would highly recommend K&D Countertops! I recently had countertops installed and couldn’t be more pleased. From beginning with my experience in the sales room; through scheduling; measuring; and installation, each employee was professional, knowledgeable, and friendly. I would highly recommend K&D for your countertop needs. Our experience with K&D was very positive. Everyone we dealt with, Jeremy, Aaron & Tim, were all super nice and great to deal with. Since we live over an hour away from their location in Trenton, we did most of our communicating by phone, text and email, and got exactly what we wanted. When they came to measure and at install time, they were very prompt, professional and courteous. We are thrilled with our countertop and definitely recommend K&D to anyone! Kelly at the O’Fallon location was very helpful. The selection was Ok. Delivery & Install was quick and completed on time. Very happy overall. We purchased Cambria quartz countertops from K&D. Anna was very helpful and patient . The store has vast choices of counter tops. The technicians installed perfectly. K&D Countertops’s was very professional and easy to work with!!! The workers were clean and informative. I would choose them again in a heartbeat!!! Our kitchen countertop is beautiful!!! Our entire experience in picking out our new countertop through installment was a wonderful experience. No pressure and professional.